Bacteria belonging to the Burkholderia cepacia complex (Bcc) are among the most important pathogens isolated from cystic fibrosis (CF) patients and in hospital acquired infections (HAI). Accurate identification of Bcc is questionable by conventional biochemical methods. Clonal typing of Burkholderia is also limited due to the problem with identification. Phenotypic identification methods such as VITEK2, protein signature identification methods like VITEK MS, Bruker Biotyper, and molecular targets such as 16S rRNA, recA, hisA and rpsU were reported with varying level of discrimination to identify Bcc. rpsU and/or 16S rRNA sequencing, VITEK2, VITEK MS and Bruker Biotyper could discriminate between Burkholderia spp. and non-Burkholderia spp. Whereas, Bcc complex level identification can be given by VITEK MS, Bruker Biotyper, and 16S rRNA/rpsU/recA/hisA sequencing. For species level identification within Bcc hisA or recA sequencing are reliable. Identification of Bcc is indispensable in CF patients and HAI to ensure appropriate antimicrobial therapy. Burkholderia cepacia is generally an environmental plant pathogen, second common to ESKAPE pathogens in humans. They were uncovered due to natural calamities and construction activities due to lack of infrastructure in developing nations. Differentiation of species within the B. cepacia complex (Bcc) can be particularly problematic, even with an extended panel of biochemical tests , as they are phenotypically very similar and most commercial bacterial identification systems cannot reliably distinguish between them. Further, reliable differentiation of these species from other related taxa, such as Ralstonia, Cupriavidus, Pandoraea, Achromobacter, Brevundimonas, Comamonas and Delftia species is challenging. In most cases from developing nations, BCC has been misidentified as non-fermentative Gram-negative bacilli (NFGNB) especially Pseudomonas spp. [2, 3]. Due to which, reports on Bcc infections are rare in India . The articles were searched using PubMed (https://www.ncbi.nlm.nih.gov/pubmed/) and Google Scholar. Multiple keywords were used for the literature search in combination or in alone. Some of the important keywords used for literature search were Burkholderia cepacia complex (Bcc), hospital acquired infections, phenotypic identification of Bcc, molecular identification of Bcc. B. cepacia, B. cenocepacia, phoenix, VITEK2, VITEK MS, Bruker biotyper, recA, hisA, rspU, 16S rRNA and WGS of B. cepacia/Bcc. Walter H. Burkholder described a phytopathogenic bacterium causing onion rot in New York State in the mid-1940s and named the species ‘cepacia’ . This was initially known as Pseudomonas cepacia, later in 1992 included in the Betaproteobacteria class, with Burkholderiales order and Burkholderiaceae family as Burkholderia cepacia . Burkholderia includes former rRNA group II pseudomonads (Pseudomonas gladioli, Pseudomonas mallei, Pseudomonas pseudomallei, and Pseudomonas caryophylli), except Pseudomonas pickettii and Pseudomonas solanacearum, which were later grouped under the genus Ralstonia . Burkholderia species were known as plant pathogens and soil bacteria, except B. mallei and B. pseudomallei, which are humans and animal pathogens . The genus now includes 22 validly described species: B. cepacia (the type species), Burkholderia caryophylli, Burkholderia mallei, Burkholderia pseudomallei, Burkholderia gladioli, Burkholderia plantarii, Burkholderia glumae, Burkholderia vietnamiensis, Burkholderia andropogonis, Burkholderia multivorans, Burkholderia glathei, Burkholderia pyrrocinia, Burkholderia thailandensis, Burkholderia graminis, Burkholderia phenazinium, Burkholderia caribensis, Burkholderia kururiensis, Burkholderia ubonensis, Burkholderia caledonica, Burkholderia fungorum, Burkholderia stabilis, and Burkholderia ambifaria . Since the mid-1990s, heterogeneity was noted among the B. cepacia strains isolated from different ecological niches. This caused problems in accurate identification of B. cepacia isolates, and evaluation of the techniques used showed that they were either not very sensitive, not very specific, or neither sensitive nor specific [10–13]. Further, Vandamme et al. evaluated a polyphasic taxonomic approach to demonstrate that presumed “B. cepacia” from CF patients and other sources were different and belonged to five distinct genomovars (phenotypically similar genomic species). This includes, B. cepacia genomovar I, B. multivorans genomovar II, genomovar III, B. stabilis genomovar IV and B. vietnamiensis genomovar V. Initially these five genomic species were collectively referred to as the B. cepacia complex (Bcc). Subsequent polyphasic taxonomic studies identified genomovar VI and B. ambifaria genomovars VII which added to Bcc [15, 16]. In addition, B. pyrrocinia was added to Bcc . Ralstonia, Cupriavidus, Pandoraea, Achromobacter, Brevundimonas, Comamonas and Delftia are the most common genus those are closely related to the Burkholderia and cause problems in accurate identification of Bcc. These are hitherto referred as non-Burkholderia spp. in this manuscript. Similarly, Burkholderia spp. (B. humptydooensis and B. pseudomallei complex) which interferes in correct identification of Bcc are referred as non-Bcc. Previously, different species within the B. cepacia complex had shown to have DNA–DNA hybridisation values between 30 and 60%, while strains of same species showed values > 70%. Whereas, values obtained with non-Bcc Burkholderia were below 30% [14–16, 18–20]. The DNA relatedness is rated as high (> 70%) in strains of same species, low (30–60%) but significant below the species level, and non-significant (< 30%). Coenye et al. , has compared the 16S rDNA sequences of B. cepacia complex and related species, where, the similarities of strains within B. cepacia complex were higher (> 97.7%) compared to other Burkholderia species (< 97.0%). Different media composition were in use for years to selectively isolate B. cepacia complex from samples of CF patients. This includes, P. cepacia medium (PC agar) (300 U of polymyxin B/ml and 100 µg of ticarcilline/ml) ; Oxidation-fermentation agar with lactose and polymyxin B (OFPBL agar) (300 U of polymyxin B/ml and 0.2 U of bacitracin/ml) , and B. cepacia selective agar (BCSA) (1% lactose and 1% sucrose in an enriched base of casein and yeast extract with 600 U of polymyxin B/ml, 10 µg of gentamicin/ml, and 2.5 µg of vancomycin/ml) . BCSA was proven effective than the other two in recovering B. cepacia complex from CF respiratory specimens by inhibiting growth of other organisms . Though, B. gladioli and Ralstonia spp. are exceptions which could grow on BCSA. On isolation, few biochemical reactions used to differentiate B. cepacia complex, B. gladioli, Pandoraea spp., R. pickettii, A. xylosoxidans, and S. maltophilia are enlisted in Table 1. Recent developments had led to invention of automated/commercial test systems for pathogen identification. However, there are several reports pertaining to inability of these commercial systems to identify or differentiate B. cepacia complex isolates from other Burkholderia spp. . Most often, cases with fulminating pneumonic infection along with fever and respiratory failure, occasional association with septicaemia, is known as “cepacia syndrome” . The overwhelming B. cepacia complex infections in cystic fibrosis patients have prompted an unusual number of studies and variety of data. B. cepacia was also frequently encountered in nosocomial outbreaks due to contaminated disinfectants, nebulizer solutions, mouth wash, medical devices and intravenous solutions due to contamination of lipid emulsion stoppers . Though, B. multivorans and B. cenocepacia were reported predominant amongst CF patients than non-CF patients as reported from United States, Canada, Italy and Australia [16, 28, 29]. Problems in accurate identification of Burkholderia spp. Phenotypic tests either manual or automated commercial systems were in use to identify Bcc in routine clinical laboratories. Though, species level identification is not achieved due to high similarity of biochemical results between species. Automated identification systems including Phoenix, VITEK 2, VITEK MS and Bruker identifies Bcc, non-Bcc and non-Burkholderia spp. at different specificities (Table 2) [30–33]. Overlapping biochemical profiles for Bcc, Ralstonia spp. and Pandoraea spp. Can identify and discriminate Bcc from non-Burkholderia spp. There is considerable interest in recent days on the reliability of MALDI-TOF MS for accurate bacterial identification. It is based on the spectral analysis of bacterial proteins, mainly ribosomal proteins, ionized by laser irradiation of the bacterial cell. Fehlberg et al. has evaluated the performance of MALDI-TOF MS for species identification of Bcc clinical isolates in comparison to recA sequencing. MALDI-TOF MS results were 100% in concordant with recA sequencing for genus level identification (n = 91), while 76.9% (n = 70) concordance was seen for species level identification. Another study by Gautam et al. , has compared MALDI-TOF MS with an expanded MLST and recA sequencing for Bcc identification. MALDI-TOF MS exhibited 100% concordance for genus identification and 82% for species level identification. The accuracy in the identification and differentiation of Burkholderia spp. in clinical specimens with the close neighbours Pandoraea, Cupriavidus and Ralstonia is essential for the treatment of patients. These three are the most prevalent genera identified outside Burkholderia genus. Most of the time these are phenotypically misidentified as Bcc. Pandoraea species have been reported from both cystic fibrosis (CF) and non-CF patients. The invasive potential of this genus can be understood through various reported cases of Pandoraea bacteraemia caused by P. pnomenusa, P. apista, P. pulmonicola and P. sputorum [35–40], where identification was a major setback when conventional biochemical methods were used. The Ralstonia genus includes R. pickettii and R. solanacearum (formerly Burkholderia pickettii and B. solanacearum), R. insidiosa, and R. mannitolilytica, where R. pickettii is still regarded as the main pathogenic species . Though R. pickettii, is considered with minor clinical significance, many instances of infections are reported in the literature. Due to high similarity between R. pickettii and Bcc, many of the Bcc cases might have been misidentified which are actually R. pickettii . Contaminated solutions including water for injection, saline solutions made with purified water, and sterile drug solutions were regarded as the cause of R. pickettii infections in many of the cases. Major conditions associated with R. pickettii infection are bacteraemia/septicaemia and respiratory infections/pneumonia [41, 43, 44]. Very often, Ralstonia and Pandaroeae are misidentified as Bcc. These genus are very closely related to Burkholderia spp., such that they cannot be distinguished by standard biochemical method . The species include Bcc (B. cepacia, B. multivorans, B. cenocepacia, B. vietnamiensis, B. stabilis, B. ambifaria, B. dolosa, B. anthina, B. pyrrocinia and B. ubonensis), B. humptydooensis, Cupriavidus spp., Pandoraea spp., and B. pseudomallei. Bcc and non-Burkholderia spp. could not be distinguished by conventional biochemical methods. Due to problem with identification, clonal typing of Burkholderia is questionable. Molecular targets such as 16S rRNA, recA, hisA and rpsU were reported to increase the discrimination of Bcc. Representation of various techniques and its ability to accurately identify Bcc is given in Fig. 1. Isolates from CF patients with persistent pathogenic colonization often lose their characteristic phenotypes or growth conditions which leads to difficulty in accurate identification of Bcc. To overcome this, molecular identification is required to distinguish species within Bcc and from the related genus/species. Though molecular targets for identification are not reliable when used individually, a multi-target approach is essential to improve the identification of Bcc and non-Bcc organisms. Some of the reported molecular targets are hisA, rpsU, recA and 16S rRNA. Discriminating ability on genus/complex/species level using these targets were listed in Table 2. Sequencing of hisA gene, encodes for an enzyme involved in histidine biosynthesis was reported to distinguish species within Bcc . Neighbour-joining method analysis of 134 Bcc organisms revealed high degree of sequence similarity between strains of same species. Meanwhile, each species was clearly separated from each other. The hisA based analysis separated 17 Bcc species in different clusters (including 4 lineage divisions of B. cenocepacia) with high bootstrap values (> 75%) . Burkholderia strains used for hisA based analysis were previously identified using a polyphasic taxonomy or recA sequencing [46, 47]. Similarly, rpsU was recognized to identify different species among the Burkholderia genus . Frickmann et al. has employed rpsU sequencing method to compare Burkholderia strains of known identity from ATCC (American Type Culture Collection, Manassas, Virginia, USA), DSMZ (German Collection of Microorganisms and Cell Cultures, Braunschweig, Germany), JCM (Japan Collection of Microorganisms, Tsukuba, Ibaraki Prefecture, Japan), BCCM/LMG (Bacteria Collection, Ghent, Belgium), and NCTC (National Collection of Type Cultures, Porton Down, UK). Also few clinical strains were included in the analysis for comparison, after ensuring their identity using recA sequencing. rpsU sequences formed four clusters including B. plantarii, B. glumae, B. cocovenenans and B. gladioli in cluster I, the Burkholderia pseudomallei complex (B. mallei, B. pseudomallei, and B. thailandensis) in cluster II, B. caryophylli, B. multivorans, P. norimbergensis, B. ubonensis, B. stabilis, B. cenocepacia, B. cepacia, B. pyrrocinia, B. ambifaria, B. anthina, B. vietnamiensis and B. dolosa in cluster III, and B. sacchari, B. graminis, B. fungorum, B. phytofirmans, B. xenovorans, B. phenoliruptrix, B. phenazinium, B. caribensis, B. hospita and B. phymatum in cluster IV. B. glathei, B. caledonica and B. kururensis were observed as outliers. Moreover, the rpsU sequence homology for Burkholderia and Pandorea was > 86%. Most of the clinical pathogens of Bcc belongs to cluster III of rpsU sequencing, where B. caryophylli, B. multivorans, and P. norimbergensis had identical sequences and B. cenocepacia clustered with B. cepacia. Limitation of rpsU sequencing is it could not reliably discriminate Burkholderia spp. at the species level as single target. recA is another well-known target promising for differentiation of Burkholderia species . recA can differentiate the following 19 species of Burkholderia namely, B. pseudomallei, B. mallei, B. thailandensis, B. humptydooensis, B. oklahomensis, B. oklahomensis-like, B. ubonensis, B. ambifaria, B. multivorans, B. vietnamiensis, B. fungorum, B. glumae, B. cepacia, B. xenovorans, B. dolosa, B. gladioli and Bcc . However, non-Burkholderia spp. cannot be distinguished by recA sequencing. Burkholderia strains used for evaluation of recA sequencing were characterised using whole-cell protein profile analysis and a polyphasic approach [47, 50]. 16S rRNA sequencing is one important option for differentiating non-Burkholderia spp. from Burkholderia spp. . The 16S rRNA similarity between Burkholderia spp. and non-Burkholderia spp. is given in Table 3. In a study from environmental sample, the different species of Burkholderia including non-Burkholderia spp. were found in the same consortium suggesting that same environmental niche hosts the sharing of genes through lateral gene transfer . Due to these challenges in identification, the clonality of these species is also difficult to investigate, as the MLST housekeeping genes are species specific. As of now, MLST database is available only for Bcc and B. pseudomallei. HAI outbreaks caused due to non-Burkholderia spp. could not be typed. Similarity of 16S rRNA sequences between Burkholderia and non-Burkholderia spp. Due to recent developments in the molecular genetics of bacteria, usage of whole genome sequences (WGS) of the bacterial pathogens is gaining interest among clinical microbiologists. The WGS data helps in typing of the pathogens and in identifying the evolutionary pattern of the organism based on whole genome single nucleotide polymorphisms (SNPs). Till date 102 genome sequences have been deposited in NCBI for B. cepacia. This includes complete genomes and shotgun genome sequences. Further baseline data on B. cepacia WGS will help to identify region specific clones, which will be handy in identifying an outbreak situation. The mechanisms of antibiotic resistance of Bcc species have been intensively studied. Major resistance mechanism in Bcc is due to efflux pump overexpression mostly by members of the resistance-nodulation-division (RND) family [52–54]. B. cenocepacia strain J2315 was reported to encode 16 RND efflux systems [55, 56]. Ceftazidime and other extended-spectrum cephalosporins are the reliable treatment options for Bcc due to intrinsic resistance to many other classes of antimicrobials. Bcc were reported with class A β-lactamases conferring resistance to β-lactam antibiotics such as ceftazidime. This was first described in B. cepacia as the PenA-PenR system , which were later known as PenB and PenR (AmpR) . Due to their complex role in activation of penB and ampC targets in the presence of an antibiotic susceptibilities to ceftazidime, cefotaxime, and meropenem were greatly reduced [58, 59]. Class A PenA β-lactamase was also reported in B. cenocepacia which is located on chromosome 2 and their genetic environment are similar to that of B. pseudomallei . However, the B. cenocepacia enzyme has not yet been shown to be involved in β-lactam resistance. In a study by Hwang and Kim , a B. cenocepacia strain J2315 PenB β-lactamase had shown a Ser72Tyr substitution, due to which B. cenocepacia has intrinsic clavulanate resistance . In addition, B. multivorans was reported to have a PenA enzyme (Bmul_3689 in B. multivorans ATCC 17616), that is closely related to PenB reported in Bcc [58, 61]. This PenB is also similar to KPC-2 a significant carbapenemase . However, the B. multivorans enzyme is an inhibitor-resistant carbapenemase, unlike in B. pseudomallei which is an extended spectrum β-lactamase. Though the active role of PenA in clinical B. multivorans is it yet established. There were also reports on difference in efflux pump and outer membrane protein mediated resistance especially for colistin in Bcc and B. pseudomallei complex (Bpc) . Due to these multiple difference in their resistance mechanisms, it is imperative to accurately identify Bcc from other Burkholderia spp for appropriate therapy. The choice for antimicrobial therapy is usually chosen based on in vitro susceptibility, while duration of therapy be based upon clinical and microbiologic response. Use of combination regimen is commonly reported for Bcc . However, it is still uncertain as the evidences were mostly limited to in vitro studies or small clinical experiences. For serious infection with susceptible strains, a two-drug combination of parenteral trimethoprim-sulfamethoxazole (5 mg/kg trimethoprim component every 6–12 h) plus a β-lactam (e.g., ceftazidime, piperacillin, meropenem) or a fluoroquinolone should be utilized . For serious infection with trimethoprim-sulfamethoxazole-resistant strains or sulfa drug allergy, combination therapy guided by in vitro susceptibility results should be administered . In a study by Blumer et al. , in 102 CF patients, meropenem/tobramycin and ceftazidime/tobramycin improved clinical status and reduced bacterial burden in 96 and 92% of treated patients, respectively. Bonacorsi et al. had proven enhanced bactericidal activity of ciprofloxacin in combination with other agents . Further, triple antimicrobial combination based on meropenem was suggested useful than double or single agents . Macrolides in combination with other antimicrobials had shown moderate synergism , while specific combinations including fosfomycin/tobramycin exhibited poor activity against Bcc . Conventional phenotypic methods could not discriminate Bcc and related genus, as there is an overlap in the biochemical characteristics. A single molecular target for differentiation of Bcc from non-Bcc and non-Burkholderia spp. is not reliable, while two or more molecular targets significantly improves the species level discrimination in Bcc. rpsU and/or 16S rRNA sequencing, VITEK2, VITEK MS and Bruker Biotyper could discriminate between Burkholderia spp. and non-Burkholderia spp. 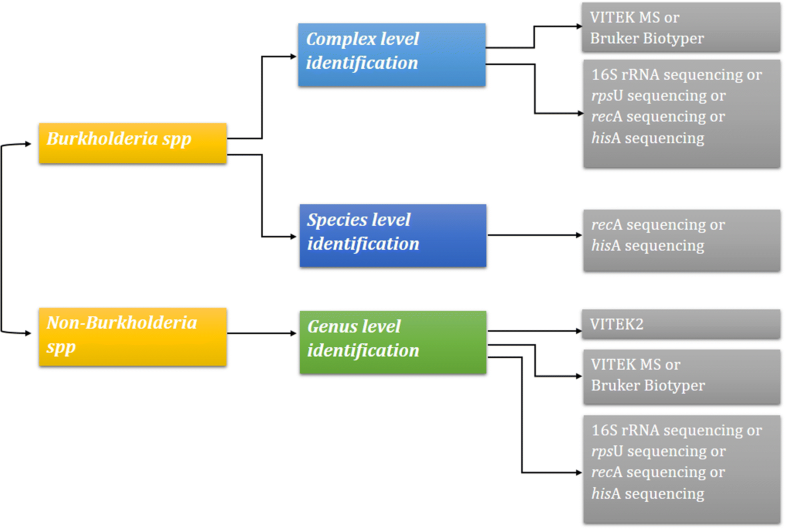 Whereas, Bcc complex level identification can be given by VITEK MS, Bruker Biotyper, 16S rRNA/rpsU/recA/hisA sequencing. For species level identification within Bcc hisA or recA sequencing are reliable. Recent advancements in genome sequencing using SNP phylogeny might help to accurately identify the clone of Bcc from non-Bcc and non-Burkholderia spp. Such identification is necessary to help in timely diagnosis of hospital acquired infections and to provide appropriate antimicrobial therapy. DRNK and VB conceptualized the article. VB and DRNK did the review of literature. The article was written, reviewed and finalised by VB and DRNK. Both authors read and approved the final manuscript. Pegues DA. Burkholderia cepacia complex. http://www.antimicrobe.org/b19.asp.